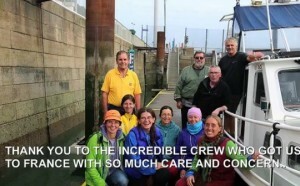 To honour our teacher Sri Chinmoy’s 50 years of peace service to the world, 4 female members of our international Sri Chinmoy Marathon Team chose another English Channel self-transcendence adventure. On Sept. 17th, at 12:42 p.m. they embarked on their 16 hour 34 min. long journey to France. 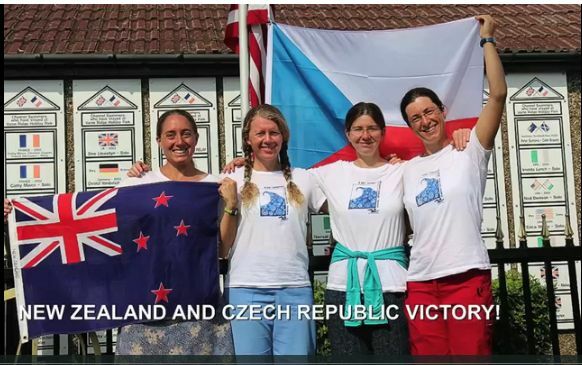 With lots of inner and outer support again from around the world, Harita from New Zealand, Abhejali (several Zurich lakes, EC relay 2009, EC solo 2010, MIMS 2012, Gibraltar Straits 2013, ), Jayalata and Ritadyumna (EC relay 2009, breaststroker) from Czech Republic and their two enthusiastic and experienced helpers (Bahula from New York and Haribala from Zlin) were lucky to have the weather gods on their side again and enjoy a great time – before, after and even at times during the swim. Victory! The flags are flying at Varne Ridge Caravan Park! 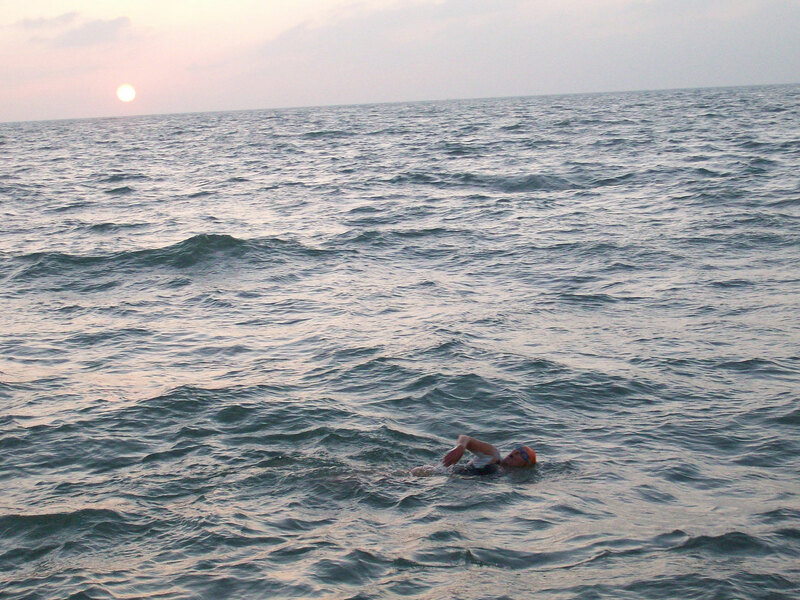 While a solo swim is of course much more demanding, a relay has its own challenges – like being cold and seasick (in spite of pills and patches) on the boat and maybe unable to eat or drink in between 3-4 sets of 1 hour swims and having to dive back into black and choppy cold water at night etc. But the experience of teamwork is even more special in a relay – and it can be a nice stepping stone for the next sized challenge, the solo. The girls were in good hands with Mike Oram on Gallivant, one of the top EC swim pilots, who has led several of our team members across already, his co-pilot James Willi and crew. I was very happy they were able to swim during the few days I was visiting Dover, so we could swim a little in the harbour, be excited and celebrate together. It would not be surprising to see another solo develop out of this relay in the near future! Here the → link to the slide show-video on vimeo again. Our boys relay team reached the Cap – in 13 h 41! On one of the best Channel swim days since July, an international 5 person Sri Chinmoy Marathon Team relay just finished, also right at Cap Griz Nez, only minutes after Anna-Carin Nordin, my recent helper on the boat, touched the rocks at the Cap (only the boys had left quite early with Chris Osmond). It is the first boys relay from our international team in 25 years – and the second that ever got inspired to do it, after the first one failed in 1985 due to seasickness, strong winds, 13°C water and night combined! Angikar, who just did a solo on August 8th, had come back to join the team – another “eternal friend” of the Channel it seems! The day was sunny, with little wind but stronger currents and they felt “suuuper”, they texted! More details by them later on their blog. 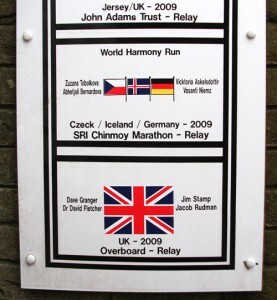 Varne Ridge Caravan Park, up on the cliffs between Dover and Folkestone (the ideal place for Channel swimmers and crew to stay when waiting for their swim) have the nice tradition of honouring their successful swimmer-guests by putting up plaques on the walls of the premises. So this is what we got for just a mere 3 hours (21 min.) in the water each! A gallery of our little adventure – some photos are still upside down, will have to be fixed later. Just click on the photo to open the gallery. Enjoy! We did it! Finishing time 13 hours 21 min. (1 min. 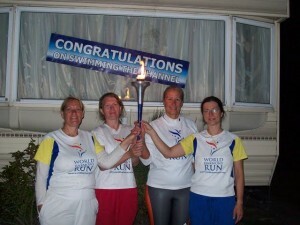 slower than our 6-person relay in 1989) on a sandy beach in silver moonlight just off Wissant. A great team effort with lots of grace and a bit of drama: during her second hour Zuzka looked absolutely miserable like she was going to die, eyes pleading ‘take me out here’, trying to swim hard and not able to breathe properly any more. ‘Marylin Bell’ was one of the mantras that would help her do lots better the third time. I was so happy to be the last swimmer and touch French ground again (after last years experience) and the last couple of hours took me back again to my solo in 1985 where I landed almost at the exact same place in similar conditions – calm, peaceful night, not cold at all, starry sky, but this time with a flood of silver light from an almost full moon. More details and photos to follow on this webalbum. For fotos of the World Harmony Run visiting schools in Dover in June this year click here.